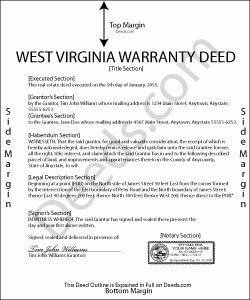 General warranty deeds are commonly used to convey real property in West Virginia. A statutory form for conveying real property is codified at West Virginia Code Section 36-3-5. When a deed contains words of general warranty under Section 36-4-2, the grantor promises to warrant and defend the property for the grantee against the claims and demands of all persons. A general warranty deed provides the most surety for the grantee. The grantor guarantees that he received clear title from the previous owner of the property, and further guarantees that no other parties, past or present, retain an interest in the property. In addition to the covenant of warranty, a general warranty deed can include additional statutory covenants under W. Va. Code Chapter 36, Article 4, including right to convey, quiet possession, freedom from encumbrances, and a covenant of further assurances. To be valid and to provide a quality public record, both the grantor and grantee must be named in the section of the deed that details the words and terms of conveyance (conveyancing clause). In addition, the property must be able to be identified by inclusion of a legal description, including the district in which the parcel is located. The granting party must sign the deed in the presence of a notary public. Property owned by a married person requires the spouse's signature because of potential marital rights, regardless of whether the spouse holds a direct interest in the property. A general warranty deed in this state is void as to creditors and subsequent purchasers for valuable consideration without notice until it is recorded in the county where the property is located (W. Va. Code 40-1-9). To record a warranty deed with a county clerk in West Virginia, the instrument must meet state and county requirements of form and content for documents pertaining to an interest in real property. All recorded deeds must be accompanied by a Sales Listing Form. Deeds recorded in West Virginia are subject to a transfer tax based on the purchase price (consideration) listed on the deed, or, if no consideration is listed, the fair market value of the property. For deeds having no consideration, a Declaration of Consideration or Value is required. Consult a lawyer with questions about general warranty deeds or for any other issue related to transferring real property in West Virginia.